The Spokane County Interstate Fair is Sept. 6-15 at the Spokane County Fair and Expo Center, 404 N. Havana St.
For more information, go to spokanecounty.org or call (509) 477-1766. The next time Rich Hartzell comes to the Spokane County Interstate Fair, it might be as an exhibitor in the dairy barn with his sons and grandchildren by his side. After 13 years, including the past eight as fair director, Hartzell is retiring. Under his leadership, fair attendance is climbing and entertainment is improving. Now 70, Hartzell is content to move home to Monroe, northeast of Seattle, to revive his family’s dairy business, Skyhart Farms, with his sons. “It’s what I’ve done my whole life,” said Hartzell, whose passion is raising and showing registered Holstein dairy cows, both the black-and-white variety and red-and-white. Even when he directed the 10-day fair and the hundreds of other events at the Havana Street venue with a $6 million annual budget, Hartzell awoke each morning at 4:30 a.m. to milk his cows. Besides showing dairy cows, Hartzell has worked in the fair industry for 28 years and is praised by Spokane County officials, staff, vendors and others for his professionalism, creativity and friendship. “You are one of the best department heads I’ve ever hired,” Spokane County CEO Gerry Gemmill told Hartzell during the gathering of about 80 people. He called Hartzell tenacious and said he ran a good business, even when his proposals for entertainment made Gemmill “gasp at the cost.” The Carnival of Madness hard rock tour in 2013 cost $150,000 but attracted near-record attendance. 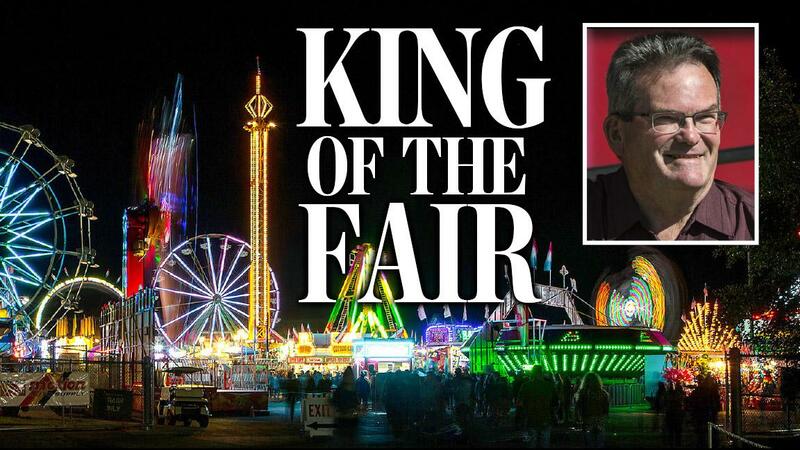 “Rich Hartzell is one of the top fair managers in the country,” said Rich Byram, vice president of Butler Amusements, which provides the carnival that is one of the fair’s top money-makers. Byram, who also retired in February, flew in from California for Hartzell’s retirement party. The two first met when Hartzell was the Evergreen State Fair manager. Besides robust attendance, Hartzell said one of the big successes last year was a change in licensing that allowed people to buy and drink alcohol outside designated beer gardens, meaning people could take a drink back to their seats in the grandstands. There were no problems with the new alcohol policy, Hartzell said. Hartzell is a self-described people person and managed the staff of 15, the fair and the dozens of other events, from the Big Horn Outdoor Adventure Show and Spokane Bike Swap to conventions, home shows, antique shows and the Junior Livestock Show of Spokane. His philosophy is to treat people like you want to be treated and he said it’s important to pay attention to the myriad details for each event. Hartzell said the fairgrounds are important because events there generate a large amount of sales tax for the county and the state. The Spokane County Interstate Fair is one of the five largest of the 66 fairs in the state. Together they generate $22 million in annual sales tax revenue, Hartzell said. Last year, the fair enjoyed gate-busting success, with ticket sales exceeding more than 200,000 for the first time in six years. Some 205,997 tickets were sold over the 10-day event in September. The fair also hit a 15-year high with 40,980 tickets purchased on the final Saturday. Food concession sales also hit a high. Hartzell is proud that they “blew the doors” off last year. He attributes it to good weather, hard work and a great lineup of entertainment, food and exhibits that excite the area’s population. Last year’s headliner was Jeff Foxworthy’s comedy show, along with the PRCA rodeo, the Trentwood Service Club Demolition Derby, and the tractor pull. The county has learned that if it spends more on entertainment, such as Huey Lewis and the News in 2012, attendance rises. “You have to do what brings people in,” Hartzell said. Hartzell began his career in Monroe, in Snohomish County, as a superintendent of the dairy department, a semi-volunteer position at the local Evergreen State Fair. He was then hired part-time as the concession coordinator and in 1994 became the fair manager. The fair work helped supplement the income of dairy farming, which is often tumultuous with varying milk prices. The 1971 Washington State University graduate came to Spokane in 2004 as events coordinator. In 2008, Hartzell became the director after Dolly Hughes retired. The county hasn’t yet hired a replacement. Hartzell said if it’s an inside candidate, the transition will go seamlessly. If it’s a newcomer, his recommendation is for the new director to take notes and observe this year’s fair before making any changes. Parking is an ongoing challenge. He thinks it’s time to offer a free shuttle, which the fair tried several years ago to little interest. Hartzell said he anticipates people will embrace the idea instead of waiting 40 minutes to park. That’s his parting suggestion before he returns to the dairy business full time. The family farm is along the Skykomish River, and his cattle mostly live on pastureland. His four sons and 10 grandchildren all live within 6 miles, and Hartzell is excited for his new chapter. Published: March 5, 2019, 5 a.m.